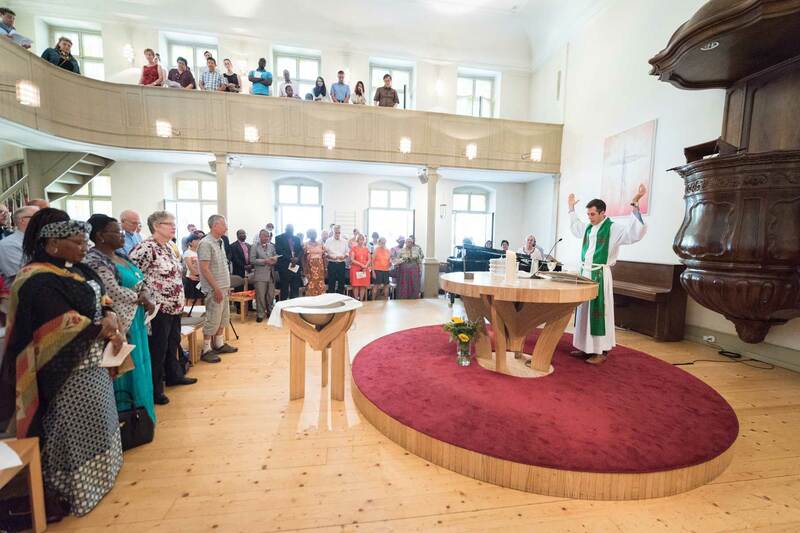 (LWI) - On Sunday 1 July, LWF Council members joined local congregants for Sunday service at the Evangelical Lutheran Church of Geneva. “Thank you for inviting us, to share in songs, prayers, word, and sacrament. We have been enriched and blessed," said LWF President Archbishop Dr Panti Filibus Musa in a word of appreciation to the congregations for receiving the ecumenical guests. The church, which is composed of two congregations, German- and English-speaking, opened its doors to LWF Council members, who participated in the services of both congregations today. A Malagasy Lutheran congregation also worships in the church. Rev. Mark Blessing, pastor of the German-speaking congregation said it was precious for the congregation to have the LWF council join for worship. "We had a slogan for the World Cup in Germany in 2014: 'Die Welt zu Gast Bei Freunden.' That is a good motto for today – to have the world, the 75 million Lutherans of the LWF, represented in our church." Rev. Andy Willis, pastor of the English-speaking congregation, shared his sentiment: "Having the Council with us today helps us feel connected to the Lutheran churches throughout the world, to the many churches that some of our members come from, and to the important work the LWF is doing in the world." A gift is all that we are and have, our gifts, our special talents: we are entrusted to do God's work in God's world. "A gift is all that we are and have, our gifts, our special talents: we are entrusted to do God's work in God's world." simply, tender, with light feet. May God's spirit guide you."